Travelers Tree with other common names, including the more popular Travelers Palm, is actually a relative of the Bird of Paradise and though its flowers are much larger than the common Bird, they are white and quite insignificant compared to the enormous paddle-shaped leaves that fan up and outward of the Traveler Tree. 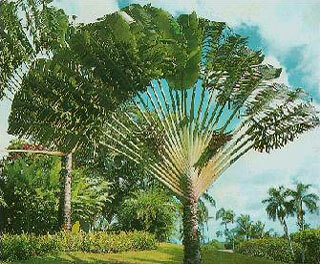 It is called the Travelers Palm because the stems hold rainwater that can be used as an emergency drinking supply. The fan shaped leaves are distinctive and are aligned in a single plane. Ultimate height is near 25 feet or more and should be grown in a sheltered area that the giant leaves do not rip or tatter during high winds. Quarterly applications of a nitrogen rich fertilizer are best. Travelers Tree is not strictly tropical, but cannot tolerate freezing weather. It is commonly used in large landscape areas, or as a specimen, and usually planted in the back of all other plants in the landscape. Eventually a trunk will form that can reach more than 2 feet thick.